Teach basic Spanish adjectives with these quick and easy activity sheets. Perfect for subs and relief teachers, no Spanish experience required! Teach Spanish vocab with no previous Spanish experience! Perfect for subs and reliefs, or as a quick extension exercise. Learn about the days of the week and the times of day! No Spanish experience required, perfect for subs and reliefs or a quick extension activity! 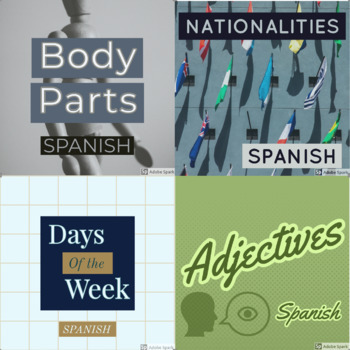 Perfect for subs and reliefs, teach Spanish vocab with no previous Spanish experience! Quick, easy, and fun! Includes activities for teaching Spanish Adjectives, Body Parts, Days of the Week, and Nationalities! Perfect handful of tasks to keep in your back pocket for an unexpected Spanish lesson or to extend students with new vocab.